Chicken is very popular here in Hawaii, not only because it is tasty, but because it is versatile and inexpensive. My favorite way to use paprika is in a simple dish called Portuguese Chicken Paprika because the sauce is just incredible! Rinse chicken pieces and pat dry; season all over with salt and pepper to taste. Set aside. Heat a large fry pan over medium-high heat and add olive oil and butter. Add chicken pieces, skin side down in a single layer being careful not to overcrowd the pot. If they don't all fit in the pot, divide the chicken into two batches. Cook, turning a couple of times, until pieces are browned on all sides, or until chicken is cooked through and juices run clear, about 20 to 25 minutes (don't burn the chicken). Transfer chicken pieces to a plate and discard all but 1 tablespoon of rendered fat from pan. Deglaze the pan with the white wine and cook for 2 minutes over medium-high heat, scraping up any browned bits from the bottom of the pot and slightly reducing the wine. Add the onion, red bell pepper, garlic and bay leaves to the pan and cook covered for about 10 to 15 minutes. Add the paprika and stir for about 30 seconds, being careful as paprika will scorch easily making it bitter. Now add the stock, and bring to a boil. Reduce heat to medium-low, then add the cooked chicken pieces, skin side down, and continue cooking covered, until everything is tender, about 30 minutes more. Now mix the sour cream with the flour and a little of the sauce until smooth, then slowly whisk the mixture into chicken stock to prevent it from curdling. Simmer uncovered, until the sauce has thickened. Taste for additional seasoning, then transfer everything to a platter, or into soup bowls. Season sauce with salt and pepper if needed, and spoon liquid over the chicken. Garnished with chopped parsley. Serve with boiled potatoes or white rice and edamame (soy beans) or green peas and Portuguese sweet bread to mop up the last of the sauce on your plate. *Notes: There are so many different kinds of paprika, with colors ranging from orange to blood red, and tastes running from spicy to sweet and flavors from smoky to fruity. 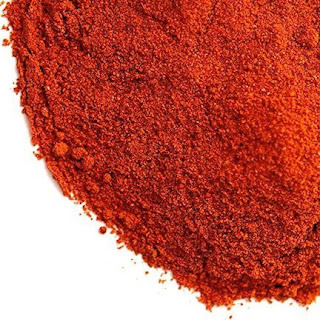 Sweet Hungarian Paprika is commonly found in the US. It is full-bodied, fruity, has a beautiful color, and is recommended for this recipe. You can use any chicken part you like, from whole cut up chicken to chicken thighs. Personally I like the dark meat, drumsticks and thighs, of the chicken because it doesn't dry out like breast meat, and has more flavor.